In February 2017, Signum University is excited to host Dr. Verlyn Flieger for a two-part seminar on the early works of J. R. R. Tolkien. “Tolkien Dark” will devote one session each to two early examples of Tolkien’s adaptation of existing myth, The Story of Kullervo and The Lay of Aotrou and Itroun as early evidence of the dark thread that runs through his fiction. The Story of Kullervo, drawn from the Finnish Kalevala, is the tale of a hapless orphan whose short life is beset with misfortune, and culminates in his suicide. The Lay of Aotrou and Itroun, from the Breton folklore collection Barzaz-Breiz, is the story of a Lord’s bargain with the Otherworld to beget an heir, and its Faustian results. 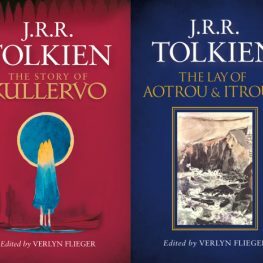 Both stories are tragedies, both express the deep pessimism characteristic of one strain of Tolkien’s work, and both foreshadow similar dark treatments in his mature fiction. We advise reading the two primary texts, and the lectures will proceed assuming familiarity with The Lord of the Rings and the story of Turin Turambar – so if you haven’t read these, you might want to start now! Join us on Monday, February 6, and Thursday, February 16, from 5:30 – 7:00 pm EST.